I hate negative outcomes like this robbery, but they are important for us to consider as we practice Active Self Protection. Half-hearted Resistance doesn’t cut it to protect against a robbery! If you value what we do at ASP, would you consider becoming an ASP Patron Member to support the work it takes to make the narrated videos like this half-hearted resistance leading to a negative outcome? https://get-asp.com/patron or https://get-asp.com/patron-annual gives the details and benefits. What does this video teach us about defending ourselves in a robbery? The first and most foundational part of Active Self Protection’s defensive strategy of “Attitude, Skills, Plan” is Attitude. You must cultivate the attitude that you are responsible for your own self-protection and you are the primary agent in your own rescue. You and only you can choose to cultivate an attitude that no one has the right to harm you or your loved ones and you have a right and a responsibility to stop anyone who threatens to harm you and yours. This clerk certainly had excellent attitude of self-protection! Evil exists in our world, and no amount of wishing it away does so. Evil people do evil things, and good people must be ready and willing to stand between them and innocent people and do enough violence to stop them definitively. No amount of negotiation will make truly evil people change their ways; only those willing and able to stop them who use attitude, skills, and plan effectively can. The key word here, though, is EFFECTIVELY. This half-hearted resistance didn’t really cut it. 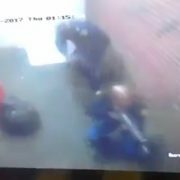 The perp in this video is a soldier home on leave who got drunk and, as we see, punches a security guard. Her ordeal teaches all self-defenders about being smart in your self protection! If you value what we do at ASP, would you consider becoming an ASP Patron Member to support the work it takes to make the narrated videos like this soldier home on leave punching a security guard? https://get-asp.com/patron or https://get-asp.com/patron-annual gives the details and benefits. What does this video teach us about defending ourselves against an attack? You must accept that danger exists and that it can happen to you. This is the foundational core of spiritual fitness and the first step in taking proactive steps to protect yourself and your loved ones. If you live in a fantasyland that nothing bad can happen because nothing bad has happened in the past, you’re setting yourself up for a terrible letdown. The guard clearly wasn’t expecting to have to get physical with these people (the soldier had just thrown up on the sidewalk which is why she had a mop bucket). Sometimes the danger that you must protect yourself and your family from isn’t evil, but is rather deranged. People who aren’t in their right faculties can be a real danger to your family, even if they are not inherently evil. You need the attitude, skills, and plan to protect yourself from evil AND from non-evil threats that pop up! This soldier wasn’t evil; he was drunk and stupid, and did drunk and stupid things. That doesn’t make him any less of a threat. Many times an attacker will give pre-attack cues during the “warmup” phase of an attack that defenders can use to anticipate what is coming. One of the most common is looking around, either for witnesses or for escape routes. If you’re interviewing/being interviewed, and in your talk notice someone who exhibits other danger signs looking left and right away from you, consider that a significant clue that something is wrong and place yourself in the best possible place to avert or deal with the potential attack. If you know there might be danger around, you cannot stand there flat-footed with your hands at your side. That’s a great way to die. Instead, if you think danger might be coming but not imminent, get your hands up protecting your head, neck, and chest. I do this by tucking one hand under the other elbow, and the free hand on my chin as if I were in deep contemplation. Others do it using the “interview position” with both hands as if they’re holding a pad and pen. Getting your hands up shaves split seconds off your reaction time, but that might make the difference between life and death if you can prepare. Police say that this elderly man attacked on the street was likely randomly targeted just because he was there. That’s the reality of self-defense, friends! This is why we talk about having attitude, skills, and plan in place to cover your ASP. If you value what we do at ASP, would you consider becoming an ASP Patron Member to support the work it takes to make the narrated videos like this elderly man attacked on the street? https://get-asp.com/patron or https://get-asp.com/patron-annual gives the details and benefits. What does this video teach us about defending ourselves against a random attack? You must accept that danger exists and that it can happen to you. This is the foundational core of spiritual fitness and the first step in taking proactive steps to protect yourself and your loved ones. If you live in a fantasyland that nothing bad can happen because nothing bad has happened in the past, you’re setting yourself up for a terrible letdown. The rabbi wasn’t thinking about his safety here and walked right into danger. Perhaps the best way to learn to protect yourself from a potential threat before the conflict turns violent is what Craig Douglas calls “Managing Unknown Contacts” (usually referred to by him and his students as MUC, pronounced “muck”). Read all about MUC in this PDF and recognize that taking a class and practicing that “left of bang” protocol which includes verbal skills, the “ask/tell/make” paradigm, reading pre-attack cues, and maintaining awareness and positional dominance is critical. These robbers remind us that we must only resist robbers if we can negate their force advantage and initiative. 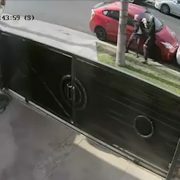 This jewelry store robbery shows how bad an outcome can be if we don’t have attitude, skills, and plan. 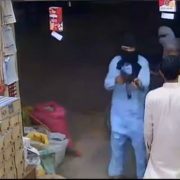 If you value what we do at ASP, would you consider becoming an ASP Patron Member to support the work it takes to make the narrated videos like these robbers storming a jewelry shop? https://get-asp.com/patron or https://get-asp.com/patron-annual gives the details and benefits. What does this video teach us about defending ourselves against robbers? We must never settle for being able to protect ourselves against a lone attacker because of how common multiple attacker engagements are. Rats travel in packs, so we must always be prepared to face multiple attackers! There were 5 robbers in this jewelry shop, and that’s about as many as I have seen in any robbery. The +1 in the Five Ds +1 is the gateway to making the empty-handed skills work: DISTANCE. You must first close the distance against an armed attacker to get your hands in the fight and start the process! If an attacker has a firearm pointed at you from more than 2 arms lengths away, the chance of you closing that distance and getting your hands in the fight is minimal at best, so recognize when your opportunity happens and use it. When you chase fleeing felons, you continue to place yourself in risk of grievous bodily harm. If you’re a sworn law enforcement officer that is a risk you’re sworn to take, but for the rest of us it’s a bad gamble. This is a stark reminder of why. If you value what we do at ASP, would you consider becoming an ASP Patron Member to support the work it takes to make the narrated videos like this stark reminder not to chase fleeing felons? https://get-asp.com/patron or https://get-asp.com/patron-annual gives the details and benefits. What does this video teach us about defending ourselves against felons? It’s dark for half the day, and bad guys of all kinds love to launch ambushes from the dark. That means, as a self-defender, that part of having good situational awareness involves keeping a flashlight on your person. That flashlight doesn’t have to be crazy tacticool and shouldn’t be firearm-mounted, because its purpose is to help you see at night to give you better awareness of any potential threats far before they can hurt you. A VERY compact option that runs on AAs is this Streamlight: http://amzn.to/1U9S39H and I carry this 1000 lumen Fenix: http://amzn.to/1S73jjb which is rechargeable and has multiple modes of brightness. A middle ground that I have used very effectively is this Olight: http://amzn.to/29htS3q. I highly recommend a flashlight for everyone, simply as an awareness tool at night. Keep that flashlight near your home defense gun so that you can positively identify threats! Even if you’re injured, you must stay in the fight and not stop as long as you have consciousness. The human body is designed to take a ridiculous amount of injury and still function, so never stop fighting just because you’re injured! Even if you’re shot or stabbed, you have a 67-95% chance of surviving! (https://get-asp.com/ew3l and https://get-asp.com/p0hn give the details) So practice emotional fitness by knowing that even if the bad guy gets the jump and you’re injured, you’re still in the fight and still likely to survive if you take definitive action to protect yourself. As they say, the best cover is fire superiority and the best first aid is to end the threat! Self-defenders must ALWAYS practice the rules of firearms safety, and these two stark reminders drive that point home. Never take a moment off from firearms safety, friends. Never. If you value what we do at ASP, would you consider becoming an ASP Patron Member to support the work it takes to make the narrated videos like this reminder of the importance of firearms safety? https://get-asp.com/patron gives the details and benefits. In the second, news stories abound: https://get-asp.com/whi0 and https://get-asp.com/kdsa shows that the police tried to cover up the fratricide; https://get-asp.com/r0tr and https://get-asp.com/ptq2 have the details of the incident. What do these videos teach us about practicing firearms safety? The first rule of firearms safety is to always keep your firearm pointed in a safe direction. ALWAYS keep your firearm pointed in a safe direction! A safe direction is one that is never pointed at someone who is not a deadly threat to you or others, and will minimize property damage if the firearm were to have a negligent discharge. If you follow this first rule, even if you somehow discharge the firearm, no one will be hurt and that’s the biggest goal. You’re responsible for every bullet that leaves the muzzle of your firearm, especially for bullets that leave the muzzle because of your negligence. You are 100% going to face consequences for negligent discharge of a firearm, so never neglect your safety rules. Always keep your brain engaged with a firearm in your hands. The second you have it in hand, THINK! Spiritual fitness is an important part of Active Self Protection. You don’t often get any advance notice of the last day of your life, but we see over and over that self-defense isn’t a guarantee of winning every fight you might be placed in. You want to be at peace with your loved ones and with Jesus, because you’ll need that peace on the day that you meet Him. Since you can’t guarantee advanced notice, make peace today. If there is a deadly threat in your area, you MUST make one of two decisions: either act to end the threat, or leave the area immediately! This video is a good, albeit scary, reminder of that. If you value what we do at ASP, would you consider becoming an ASP Patron Member to support the work it takes to make the narrated videos like these bystanders staying in the danger zone? https://get-asp.com/patron gives the details and benefits. What does this video teach us about defending ourselves against an active threat? The first and most foundational part of Active Self Protection’s defensive strategy of “Attitude, Skills, Plan” is Attitude. You must cultivate the attitude that you are responsible for your own self-protection and you are the primary agent in your own rescue. You and only you can choose to cultivate an attitude that no one has the right to harm you or your loved ones and you have a right and a responsibility to stop anyone who threatens to harm you and yours. Perhaps the biggest benefit of situational awareness is that it buys you time and space to respond to a threat, and time and space buy you options when considering how to protect yourself and your loved ones from a threat. Time and space give you the chance to escape and evade, or time and space to get your force multiplier in the fight, and time and space to better your defensive position and give you a better chance to be victorious. 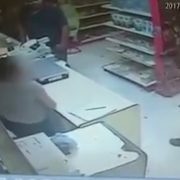 This supermarket employee was attacked simply for being in the wrong place at the wrong time; his ordeal teaches all of us some important Active Self Protection lessons. If you value what we do at ASP, would you consider becoming an ASP Patron Member to support the work it takes to make the narrated videos like this supermarket employee attacked at random? https://get-asp.com/patron gives the details and benefits. What does this video teach us about defending ourselves against a knife attack? You must accept that danger exists and that it can happen to you. This is the foundational core of spiritual fitness and the first step in taking proactive steps to protect yourself and your loved ones. If you live in a fantasyland that nothing bad can happen because nothing bad has happened in the past, you’re setting yourself up for a terrible letdown. In any territorial or predatorial violence, the attacker gets to set the time and circumstances of the attack. They will almost always launch that attack from ambush, or as we like to call it in Umas, from “obscurity.” Surviving that ambush is one of the most important keys to successfully defending yourself. Thankfully the clerk did survive the ambush. In the ambush stage of an attack, it’s simply not possible to defend against every single kind of attack that may come your way. Some tacticool folk I know think that they can thwart any potential attack that might be aimed at them, but honestly we see on video that they’re simply mistaken. Sometimes that first attack is GOING to succeed against us, no matter what, so our response must be able to include the fact that we may be diminished from absorbing that damage and staying in the fight. This is primarily an issue of emotional fitness, being able to stay mentally and emotionally present so as to end the threat and then assess our condition. 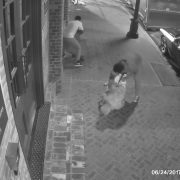 This robbery and beating were hard to watch, but this stuff doesn’t just happen in the French Quarter of New Orleans. Use your awareness to protect yourself! If you value what we do at ASP, would you consider becoming an ASP Patron Member to support the work it takes to make the narrated videos like this robbery caught on camera? https://get-asp.com/patron gives the details and benefits. There are a LOT of news stories on this robbery from the French Quarter and many others. https://get-asp.com/wnwi and https://get-asp.com/g643 lay out the basics. https://get-asp.com/6egs shows that they’ve arrested at least 3 of the suspects. 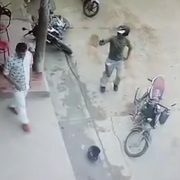 The unfortunate truth is that these robbers had been helped by good people before this robbery, according to this op ed: https://get-asp.com/u2uj and that’s frustrating. 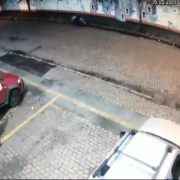 What does this video teach us about defending ourselves against an ambush robbery? It’s dark for half the day, and bad guys of all kinds love to launch ambushes from the dark. That means, as a self-defender, that part of having good situational awareness involves keeping a flashlight on your person. That flashlight doesn’t have to be crazy tacticool and shouldn’t be firearm-mounted, because its purpose is to help you see at night to give you better awareness of any potential threats far before they can hurt you. A VERY compact option that runs on AAs is this Streamlight: http://amzn.to/1U9S39H and I carry this 1000 lumen Fenix: http://amzn.to/1S73jjb which is rechargeable and has multiple modes of brightness. A middle ground that I have used very effectively is this Olight: http://amzn.to/29htS3q. I highly recommend a flashlight for everyone, simply as an awareness tool at night. 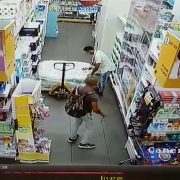 There’s a reason we harp on people not to chase robbers when they run off…if they’re armed, you place yourself in needless danger, like this shop owner did. Here’s hoping he makes a full recovery. If you value what we do at ASP, would you consider becoming an ASP Patron Member to support the work it takes to make the narrated videos like this owner chasing fleeing robbers? https://get-asp.com/patron gives the details and benefits. Remember, at the end of a defensive encounter your goal is to get to safety and end the threat against you and your loved ones. Pursuing a fleeing bad guy for whatever reason is unwise because they very well may counter-ambush you or hurt you to make their escape. Once the threat ends, let the threat go and take action to make yourself safer.